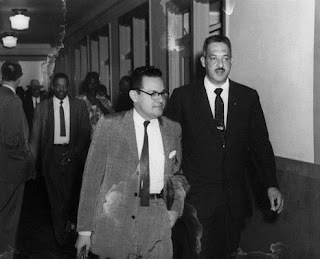 Wiley Branton (left), Little Rock NAACP attorney, and Thurgood Marshall, special counsel of the NAACP at the U.S. Court of Appeals hearing on the Little Rock school desegregation case in St. Louis, 1957. Voting is the unique privilege we are all given as citizens of the United States of America, which is still a great country. We certainly have our challenges, and those challenges must be addressed. It is our responsibility through our vote to support the candidate we think can best solve these problems and keep this great country great. Despite our problems, the “Good Old USA” is where I want to be. I was distressed when I visited the website of the Pew Research Center to check on voting in America. Their headline read as follows: “US voter turnout trails most developed countries.” They further reported that only 53.6% of US citizens who were eligible voted in the 2012 Presidential election. Countries cited with the highest voter turnout include Belgium, 87%, Turkey, 84% and Sweden, 82%. Census records indicate that America’s voter registration rate is currently 62%, while Canada and the United Kingdom are 91%, Sweden, 96% and nearly 99% in Japan. America can and should do better. 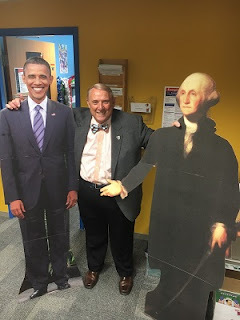 Voting, this great American freedom, has always been important to me and my family. My wife Wylene insists that we all vote in every election for which we are qualified. She does this because she personally understands the struggle many Americans went through to get the vote, including women and people of color. As a child she observed the work of her father, the late Wiley Austin Branton, head of the first Voter Education Project. In Atlanta, Georgia, in 1962, the Voter Education Project (VEP) was established under the auspices of the Southern Regional Council. The project was created to assist the major civil rights groups in the country in expanding their efforts in voter registration. These organizations realized that for systemic changes to occur, the disenfranchised people of color had to become part of the system. This could be accomplished only through voting and through the courts. The VEP was in a precarious position because as a tax exempt organization, “politics” was off limits. Ironically, however, it was politics that supported the creation of the VEP. The Kennedy administration endorsed VEP because it disliked direct, active protest, which it felt embarrassed the US on the world stage. Wiley Branton was asked to lead this important project because of his history as an effective civil rights leader. His involvement began in high school when he led a protest against the segregated school system of his home town, Pine Bluff, Arkansas. In 1943, he was drafted into the army. While many WWII veterans began their activism after the war’s end, Branton wrote a letter to the government protesting the treatment of Black soldiers while he was still active in the army. This experience led him to law school and later to work as a champion of civil rights. His most famous case was the Little Rock Nine Desegregation Case that focused on Central High School. Because of this work, he was asked to be the first director of the VEP. During his tenure, more than 600,000 African Americans were registered to vote, and the landscape of Congress changed dramatically. And today, all in our family honor Wiley by going to the polls. While I would like to tell you for whom to vote, I will restrain myself. But I will encourage you to vote. Even if you don’t feel drawn to either candidate and see them both as flawed, you should vote. Because we elect humans, all our presidents have been flawed. Be a good student. Study the candidates and decide who is more likely to work on the issues and goals that are in your best interest and in the best interest of America’s future. You are one person. Exercise your privilege of your one vote, and you can make a difference.